Featured on Jerry Seinfeld's, Comedians in Cars Getting Coffee, with guest star Ellen DeGeneres. Learn more here. 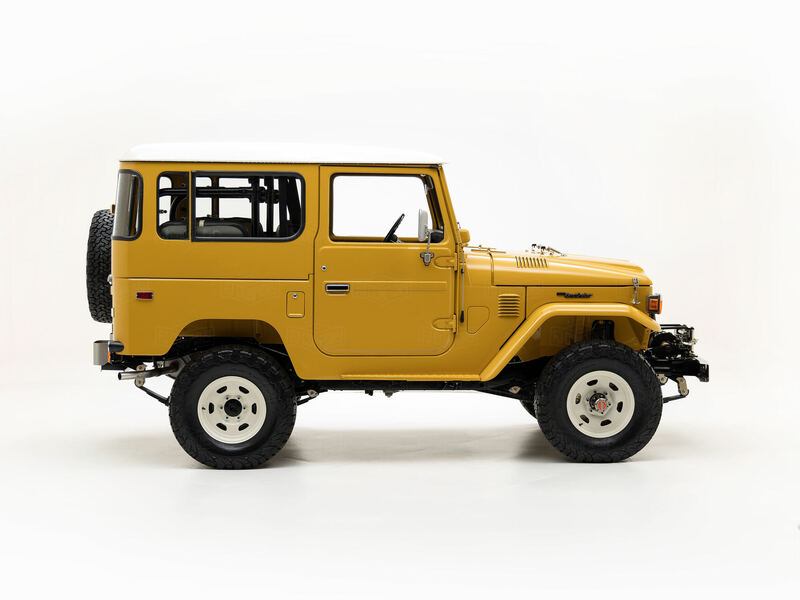 This highly original FJ40 was delivered to The FJ Company from Palo Alto, California as a contract restoration, ordered by an enthusiast of high-end classic automobiles. This FJ40 met the stringent criteria that seasoned restorers look for in a donor: matching numbers, original engine, and minimal rust – all it needed was a proper restoration, which is where we came in. This FJ40 is 100% West Coast – right down to the restored emissions equipment that keeps it street-legal in California. Its classic exterior received a fresh coat of factory paint (Yellow 532), a set of 80's model Toyota white wheels with 31" BF Goodrich® All-Terrain tires, and a newly restored, original Toyota PTO winch. Inside, the cabin is a rugged oasis, accented with retro-style pull-knobs and gauges, painted metal, and vinyl. Without sacrificing the FJ40’s rugged nature, we infused this ride with some discreet updates to enhance drivability. We rebuilt the power steering system and added Old Man Emu suspension for a more controlled and comfortable ride. Then, we completely rebuilt the powertrain using the original engine and 4-speed manual transmission, with a slight adjustment to the axle gear ratios for a more efficient driving experience. This FJ40 is what the classic Toyota Land Cruiser has always been – bold in its simplicity, and iconic in its utility. Yet, A/C flows freely throughout the cabin, and the stereo system is iPhone®- and Bluetooth®-ready. But you’d never know this FJ40 was equipped with such civilized features unless you really looked — and that’s the whole point.